=== Also on the Steam Workshop, for those who prefer. Attention: Please read at my FAQ in this page before posting a question. I believe that is common courtesy. 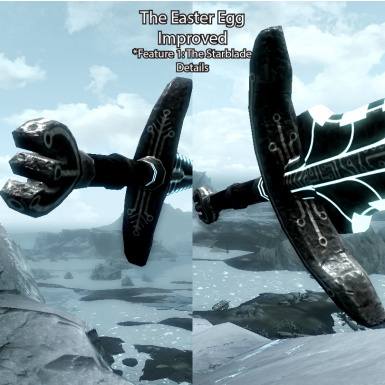 If you want to experience the content blindly, then all you need to know is that this mod improves the Bleakcoast Cave Easter Egg by fixing it to look as Bethesta intended. Furthermore, it adds a moderately tough boss and a unique reward. 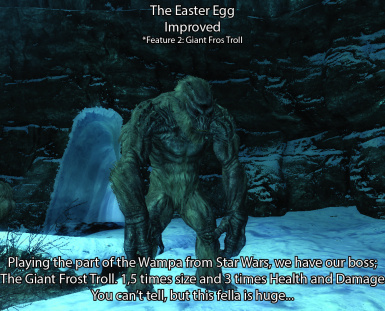 - FIXES the Bleakcoast Cave STAR WARS Easter Egg by fixing the ‘Don’t Havok Settle’-Glitch that plagued this, among many dungeons. This has been accomplished by adding a script to the objects that were supposed to act as static, forcing them to do so. 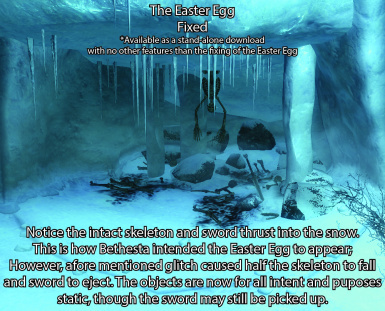 The Easter Egg now appears as Bethesta intended, as opposed to a pile of bones with a sword. 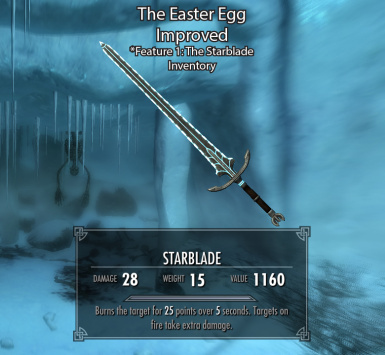 - ADDS a unique Greatsword, the Starblade, which is a fantasy interpretation of a Lightsaber; Instead of severing limbs though, the sword deals 25 base damage and 25 fire damage over 5 seconds and swings slightly faster than a regular Greatsword. It cannot be disenchanted, but can be improved at a grindstone with a Flawless Sapphire (I thought this was cleaver, as the blades of Lightsabers [in the expanded universe] are focused through a crystal, of the same colour as the blade). 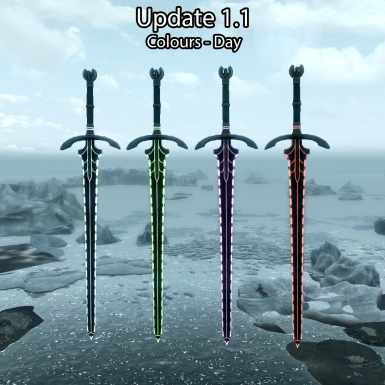 WARNING: changing the colour of the Starblade will reset all improvements, which could turn out expensive, given that these are made with flawless gemstones (you will be refunded ONE gemstone, of the colour you changed from, in order to not penalise trying different colours). Choose your colour wisely! No future plans exist for this mod at this point. 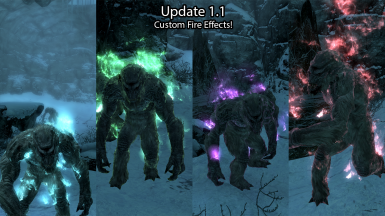 This mod will conflict with any that alters the Bleakcoast Cave dungeon. A: I like Star Wars a lot and I wanted to pay a small tribute. I think fans might enjoy living a little bite of the story this way. 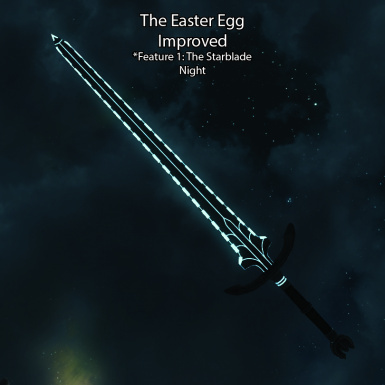 Q: How did you get the sword to glow? A: See this tutorial and forum topic for further help. 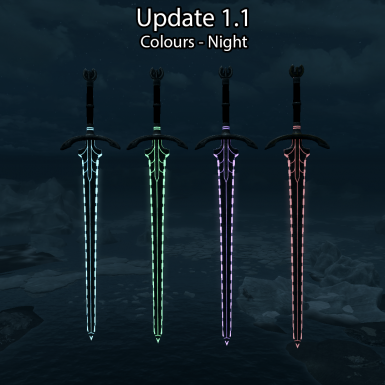 Retexturing weapons to glow is a very easy [and awesome] thing to do. 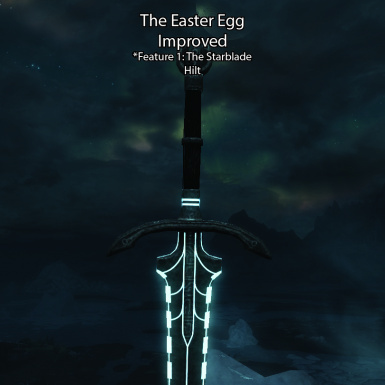 I was able to make my first glowing weapon within two or three hours, and I’m not really that smart. Give it a go! 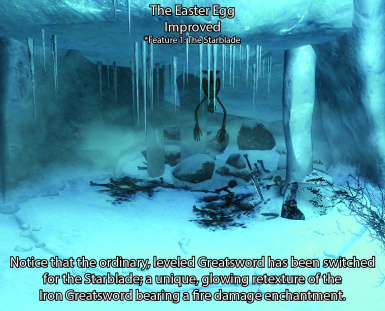 Q: I was able to find my way around the big troll and get the sword before the boss-battle. Is this exploit intentional? A: Not as such. While the dungeon is designed that way, neither did I want to add two trolls nor edit the layout of the dungeon itself - my knowledge of cell editing is limited, so I didn’t want to end up breaking anything. I would always suggest trying to beat the boss first, and then regard the sword as a reward, but however one plays the dungeon is up to the player. 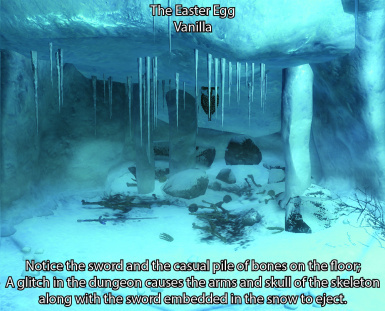 Q: The Troll boss seems unable to move within the small ice-caves. How did he get into the cave in the first place? A: Well, You can also bait the rest of the trolls to the protruding rock in the big chamber, and just shoot them from there; but if you’re looking for a challenge then I suggest you stop looking for loopholes. 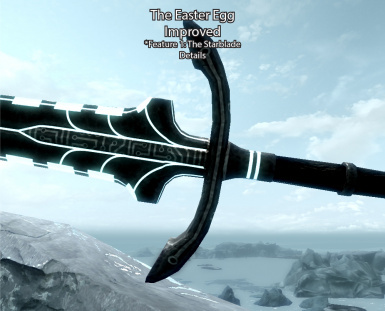 Q: This sword seems sorta OP/UP? A: Everything becomes OP at higher levels of the game. 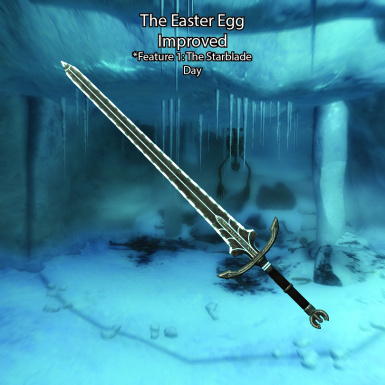 I realise that this sword is not the most powerful weapon in the game, but I did not want it to be a one-hit-killer. - The awesome guys who roam the ‘Quick Questions, Quick Answers’-topics on Bethesta Softworks’ Creation Kit Forums - I could not have done this without you!